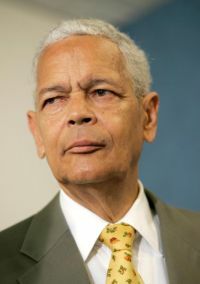 ATLANTA (CNS) — Julian Bond, a leading figure in the civil rights movement and the first African-American in Georgia’s Legislature, died Aug. 16 in a hospital in Walton Beach, Florida, of complications from vascular disease. He was 75. Born in Nashville, Tennessee, Jan. 15, 1940, Bond moved with his family to Atlanta, where he went to Morehouse College. While at Morehouse, he founded a group called the Committee on Appeal to Human Rights, which desegregated Atlanta’s lunch counters. The group eventually melded into the Student Nonviolent Coordinating Committee, for which Bond became communications director for six years. That organization pressed the issue of civil rights and voter registration in the Deep South. Bond won election to the Georgia House of Representatives in 1965 in a new district carved out for blacks, but the House leadership refused to seat him, citing Bond’s support for a Student Nonviolent Coordinating Committee declaring “violation of international law” by U.S. policy in Vietnam and advocating the burning of draft cards. It took a year, but the U.S. Supreme Court ruled Bond’s exclusion from the state House was unconstitutional. He served eight years in the House, followed by a dozen in the Georgia Senate. Because the Legislature was a part-time job, Bond often augmented his income by public speaking, including remarks at Catholic venues. At a 1970 talk at Seton Hall University, a Catholic university in South Orange, New Jersey, Bond acknowledged gains among African-Americans, although “some things haven’t changed,” citing an infant mortality rate for blacks twice that of whites, a 30 percent black high school graduation rate and a 40 percent black unemployment rate. In a 1973 interview with The Evangelist, newspaper of the Diocese of Albany, New York, Bond said, “Nonviolence is quietly alive” and that it can be “a way of life and a technique,” evident “across the country — picket lines at a grocery store that won’t hire blacks, a march to obtain revenue sharing dollars. But there are no longer the big marches” that marked the civil rights drive of the decade prior. Bond gave up his Georgia Senate post to run for Congress in 1986 in a race he lost to another veteran of the civil rights era, John Lewis. Outside of electoral politics, Bond was chairman of the Southern Election Fund, which aided candidates in 11 Southern states. He was also the first president of the Southern Poverty Law Center, serving 1971-79. Bond also served 11 years, 1998-2009, as chairman of the NAACP. Bond’s first marriage, to Alice Clopton, dissolved after 29 years. In 1990, a year after the divorce, he married Pamela Horowitz. He is survived by her and by five children.